In Butler County, the answer to that question is suddenly: “Quite a bit!” On several fronts throughout the county the safety of shale-gas drilling and fracking is being questioned, particularly in close proximity to schools and residences. Concerns are being raised, voices are being heard, legal issues pertaining to the PA Supreme Court's recent ruling re: Act 13 are being discussed. Bravo! In the City of Butler, a group of concerned residents questioned City Council's decision to market Butler's Memorial Park for gas drilling. Even though said drilling would not create surface impacts in the park, the thought of having a drilling site close enough to the city to reach under the park was enough to raise concerns. The group is concerned about a possible decrease in property values as a result of the noise, traffic, and a general distrust of fracking, and of course they worry about possible negative impacts on their domestic water supplies. But beyond all that, the group wants to protect Moraine State Park. The area in which XTO wishes to drill is in a watershed area. When it rains, water fills the creeks and culverts and goes directly into Lake Arthur. 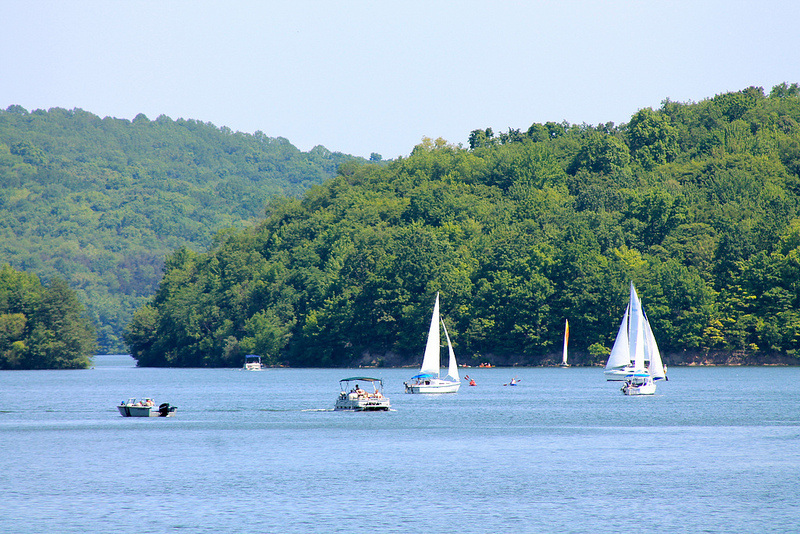 Any kind of a spill or leak could mean disaster for the lake. There is a lot going on in Butler County and surrounding areas regarding people speaking out on the dangers of shale-gas drilling and fracking. And yet the industry still remains deeply entrenched in western Pennsylvania, and there is no guarantee that any one of these actions will be successful. It is definitely a “David vs. Goliath” effort. But we all know how that story turned out, don't we? But beyond the prospects of winning or losing, there are other compelling reasons for waging these campaigns. As one Franklin Twp. resident said: “To me, silence is consent.” And yet there are still deeper reasons for continuing the fight. surely you did something, when the seasons started failing? The following are news items related to issues with shale-gas drilling/fracking and the oil and gas industry that have appeared since our last newsletter. There are a number of them. It's amazing, the magnitude of issues attendant to this industrial process, and it can be overwhelming. Therefore, we urge you to take your time with these news items; unfortunately, they're not going anywhere... They have been arranged by category for your convenience. Go first to those categories which grab your interest; you can read the rest of them later. Recent health reports related to fracking, including an [8-month investigation] of air quality in the Eagle Ford Shale play of s. Texas, a new study of [cancer clusters] in the Barnett Shale (n. Texas) and a recently released study of [airborne toxins] in Washington County, PA. Re: the latter study, lead researcher David Brown stated that, during peaks in emission levels throughout the day, a person could get what amounts to a full day’s exposure of airborne toxins in half an hour... PLUS: a [newly-released] study on air quality in the Eagle Ford Shale. “The numbers are mind-boggling. Welcome to an increasingly dirty and unhealthy environment in a state wholly unsympathetic to the health and welfare of its people and wholly beholden to the industry.” Sound like PA??? But wait! There's more! The Endocrine Disruption Exchange (TEDX) is hosting a [six-week online series] on Fracking, Natural Gas and Maternal Health. Plus, a recently released study by the scientific organization [Physicians Scientists & Engineers for Healthy Energy] states that “there is evidence that shale and tight gas development is associated with pollution that is known to increase public health risks.” (And State Rep. Daryl Metcalfe recently stated that “science has proven” drilling is safe!) 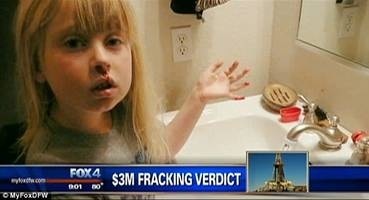 And finally, a Texas family was awarded [$3 million] in the first ever verdict to be handed down over the negative health impacts of fracking. Oil and gas companies were [fined $2.5 million] by Pennsylvania environmental regulators last year for violations at well sites and pipeline routes. PA DEP has cited Chevron for [nine violations of oil and gas laws] in connection with the February gas well explosion in Greene County. Chevron says it is “evaluating” the allegations of violation. Try that the next time a cop stops you for speeding! … DEP says the issue of violations is a prelude to “negotiating a fine” in the case... Why is a fine “negotiated?” Why isn't a fine just levied??? Hey!!! Who's in charge here???!!! The PA Department of Environmental Protection [does not always keep public records of pollution complaints] related to natural gas drilling. Also, a 2½-month investigation by the Pittsburgh Tribune-Review found that Pennsylvania state inspectors [failed to inspect] more than 45 percent of the 4,075 industrial plants, refineries, mines, sewage treatment plants and other facilities with permits to discharge into the Ohio River watershed (which includes Butler County) over the past five years. “Spill Baby Spill” has been an ongoing tally by MOB of the vast number of spills, leaks and explosions caused by the oil and gas industry. Any of these incidents by itself is bad enough; when viewed collectively, one can only ask: “Where is the 'bridge' to clean, renewable, fossil fuel-free energy?” Clearly, that bridge needs to be built soon, and quickly. 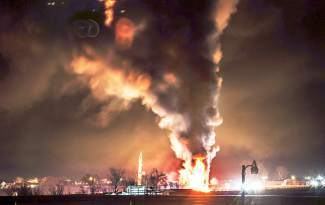 Last month we featured the massive gas well explosion in Greene County, PA. This month's selection of spills, leaks and explosions (by no means an exhaustive list) features reports from: [CO,] [OH,] [AL,] [TX,] [ND,] [IN,] [WV,] and [WA.] Also, a study published recently in the Proceedings of the National Academy of Sciences revealed that drilling operations at hydraulic fracturing sites in Pennsylvania were releasing plumes of methane [100 to 1,000 times the rate] that the EPA expects from that stage of drilling. And recently, locally, the DEP is investigating a [“significant” leak of fracking waste water] from the faulty liner of a frack pond in Washington County PA, and fracking water and diesel fuel spilled into [Chartiers Creek,] also in Washington County, as a result of a truck crash. [Ninety-one Illinois communities] powered by green energy! Why not PA? And a [funny-looking tower] that generates 600% more wind energy than traditional wind turbines. And, why are [so many veterans serving in the solar industry?] Some feel it is a matter of national security. Fossil free Energy Fair. Coming on July 26! Dr. Stolz showing the laterals of the drilling sites around the Woodlands, Butler County, PA.
On Saturday, Apr. 26, Dr. John Stolz of the Center for Environmental Research and Education at Duquesne University presented a program at the Butler Public Library, sponsored by MOB, that explored the causes of water contamination in the Woodlands development of Connoquenessing Township. For starters, Dr. Stolz was able to repudiate two key findings in Rex Energy's investigative report of the contamination incident which found Rex to be not responsible for the contamination. First, the Rex investigation said there was no difference in water quality pre- and post-drilling; Stolz showed DEP water reports that showed marked differences in water quality pre- and post-drilling. Second, Rex claimed that the areas of water contamination were uphill from their wellpads and so could not be contaminated by them, since “water flows downhill.” Stolz took a two-pronged approach to this argument: 1.) a wellpad location map superimposed on a topographical map showed Rex wellpads to be located on points of highest elevation in the area, and 2.) topographical features have nothing to do with the direction of subsurface water flow. With a map that pinpointed residences with bad water or diminished water flow and residences with no water complaints, Stolz commented that sometimes residences with good and bad water can be right beside each other. The reason, Stolz explained, is difference in water-well depth. Water wells in the Woodlands area vary in depth from 62 to 900 feet. Thus two houses side by side could be tapping into vastly different and unconnected sources of underground water, depending on well depth. Dr. Stolz informed us that the Woodlands is one of the most heavily-drilled areas of Butler County. There are 15 wellpads and 65 lateral gas wells within 2.5 miles of the Woodlands. There are also a number of abandoned coal mines and abandoned “legacy” gas and oil wells in the area. And therein, according to Dr. Stolz, lies the problem. Stolz explained that the fracking of the 65 wells in the Woodlands neighborhood has involved 3 to 4 million gallons of water and 3 million pounds of proppant material per well, per frack, all injected into the earth at 10 to 12 thousand pounds of pressure per square inch. Stolz believes that this immense amount of pressure applied in a very short period of time has released contaminants from pre-existing wells and mines. That, along with casing failures that have been cited by the DEP for Rex wells in the area, could well have contaminated aquifers under the Woodlands. While Dr. Stolz's research is ongoing, he states that the data thus far strongly suggests that drilling activity in the Woodlands area is responsible for the negative water changes experienced by several Woodlands residents. There are over 30 families from the Woodlands now receiving potable water from a volunteer water bank at White Oak Springs Presbyterian Church on Shannon Road. MOB wonders how much more data will it take for the county commissioners to allocate drilling impact fee monies to help these Woodlands residents to have good running water in their homes. On Saturday, May 10th there will be a Pedaling Tour of Butler County, which will be a 20 mile ride along the Butler - Freeport Trail (10 miles out and back) beginning at 1 PM. Local experts will discuss fracking in Butler County. Contact Mike, same as above, for more information.